I arrived at the summit unsure about the whole idea of Competency Based Education (CBE) –not sure I liked the idea much. I related to the conceptual foundation that competencies form a basis for accountability, because I taught in a career-technical program for many years. In our program, each course had competencies to be met, but they were traditional courses with a certificate and/or degree attached. I also thought that we didn’t need “no stinkin’ badges”. I was wrong. I left the summit with a much better understanding of the variety of programs that could be developed around CBE, that institutions could create these options as just that, additional options, and that students could definitely benefit! I noticed that Cali reference an important thing to consider when thinking about CBE, this approach can easily be one of several at an institution: traditional rtf, “traditional” online (isn’t that funny), and CBE ( both online, hybrid, and rtf). I learned that the idea of badges with meta data (information attached), could provide students with not only skill verification, but confidence chips, as they journey through their educational life. Additionally, I was reminded about what it felt like to put “course work” at a particular institution on a job application with no attached degree completion. That looked like I hadn’t finished something, when in fact, I had obtained some valuable information from those stand alone courses! I think, for me, the timing couldn’t have been better. My own daughter is a single mom (the dad is not in the picture even) who has been making a fairly decent living for herself and her four year old son by working in a sales call center. What she says after four years at that job is that there is nothing for her to aspire to and no way to change the day-to-day. She has tons of skills, but no education beyond high school, despite my efforts to provide for that! As I reflected on on the summit, which highlighted a very non-traditional approach to educating the students of this country, I understood my daughter’s situation better and saw an opportunity for her to grow and develop through this approach. When I came home I expressed my enthusiasm for badges and CBE to a couple of colleagues who questioned the idea of badges as being trivial and related to boy scouts. I understand their reaction because they don’t know about the meta-data that verifies the badging effort and I agree that I wish there was another word for “badge”. My hope is that their minds will change as they learn more about the idea, mine did. My colleagues are amazing and forward thinking so I know that we will grow into this idea. I am not so sure about everyone in academia. If we all could just get out of our own academic comfort zones a little bit, consider the student need scenarios for all students, not just the academic top tier, we could really change the lives of so many Americans who we are not adequately serving now. Responding to not being noticed and other stuff. There's a really good post about who (private or public) is offering more online education at the WCET site that shows the data! Guess who, before you go to the WCET blog post. The link to the WCET blog follows my comments. This post brings up some important distinctions between online delivery in the last ten years and the MOOC agitation of the conversation of recent months. I think MOOCs have a place in our educational world, but their first kudos from me comes in appreciation for provoking the conversation about Distance Education into the main stream of funding mechanisms! Cases in point are the Gates Foundation granting of funds to get developmental and beginning level MOOCs off the ground and the granting of $156.9 million dollars to the California public college systems for providing access to courses for the students of the state. "At the opening press conference for one of the big-name MOOC providers, a member of the press asked if the MOOC leaders had sought advice from others already involved in distance education. One of the MOOC leaders responded that they saw no reason to consult with for-profit institutions. Did we mention this was someone from a research university? First, the leader thought that distance education equated with for-profit institutions. Second, even if only for-profits were involved, wouldn’t you want to learn from those with experience? Double sigh." When I was in Philadelphia at the Coursera Partners' Conference last year, I was really surprised to find that most of the faculty members who were teaching MOOCs from elite institutions, had not taught online before. Furthermore, their institutions were not offering regular credit for online courses that they were offering. I think that's changing now with the advance of the MOOC experience. I hope that in the future we will all lean on each other more to tap into experience. The group of us that received Gates grants for writing classes have learned so much from each other and I am so grateful to the educators from those universities (yes, elite) for their openness and willingness to work with a California Community College. I know we all can benefit from the type of collaboration we have shared in our MOOC/Gates effort. My response to the WCET post follows here and I hope it is useful to you. Thanks for this follow-on discussion. There were a few that struck me as I read both your [Russ'] work and Phil’s. Unknown Experience: First, it has been really frustrating to me that many educators seem to forget that some of us (public 2-year colleges in particular) have been involved in offering online courses for many years. When UC started thinking about doing online work about four years ago, they wanted to investigate the efficacy first. I wanted them to at least ask us. Our experience could be informing a number of institutions who don’t realize what we know. We’d be happy to help. When I participated in the 20-Million Minds Evolve panel discussion with students a couple of months ago, I asked students how important good course design was to them in online classes. They were very clear that good design and experienced (well trained) online instructors made a huge difference. (The link to that conversation is at the end of this post.) Those of us who live or die by success rates in the public sector have refined effective design and professional development into an art. We have a lot we could be sharing with our higher-than-us institutions. Why our students are local: When you look at where the online students come from, it’s no surprise to see that in the public setting, they are local. In the launch of e-literate TV, Michael Feldstein asks the question about our needs and goals for offering online programs and he isn’t the only one asking. Our accrediting agency requires us to state the “reason” we offer online classes when we write our reports. That reason most often is to provide more access to courses that are full on-ground or to accommodate student completion schedules. Justifying online offerings for other reasons becomes a sticky issue to publicly funded institutions. Why we don’t do exclusive: It’s also rare to find courses that are offered exclusively online in the public setting. We also have mandates to provide equal access for all cases and some students are not able to take online classes for a variety of reasons of their own. Again, I thank you and Phil HIll for bringing this data and the analysis to light. https://www.youtube.com/watch?v=HHw713fpfPw#t=7264 the design conversation is about 2 hours into the video. I think that the California Community College OEI program at Foothill and Butte Colleges, will, in their state wide efforts have to address this in the application and common assessment processes, but we need to be vigilant in our classes and our own processes in the meantime. 2. Individual colleges will have to put in place any technology safeguards possible (the least of which is password refresh process for your CMS, if you don't have one.) and possibly, hire a service like Proctor-U. 3. DE Teachers will have to use multiple measures of assessment (not high stakes tests), proctoring where ever possible (can be done remotely-put a process in place), talk to their students about what cheating, plagiarism, and financial fraud are (they get emails asking them "please don't drop me, I'll loose my financial aid!" all the time), and watch for patterns of disengagement. This is going to be a huge issue and all of the colleges offering DE programs will need to stay on top of it. I've been thinking a great deal about the issues of student integrity in the online environment (and everywhere) lately. It all started back in the fall of 2013, I gave a keynote presentation about the state of online learning in California. Before the presentation, I was sipping coffee with some of the teachers in the room and we were talking about our students and how they have changed over these past few years. I originally had a whole presentation prepared about innovation and the like, but as I faced the teachers assembled waiting for my presentation, I changed my mind. Instead of starting with my planned presentation, I started with a question. I asked those teachers how many had policies covering cheating and plagiarism on their course syllabi. Almost all raised their hands. I then asked how many had definitions as part of those policies and many hands went down. My last question was how many had a discussion forum set up that gave students insight into why integrity was important to them, both to the student and the teacher. Not a single hand remained in the air. We so often jump to codify the infractions of cheating and plagiarism along with the strict consequences in our course policies. We assume, even though we know that we are not correct, that our students understand what cheating, plagiarism, and financial aid fraud actually are. Moreover, we assume that they both know when they are out of integrity with their work and know that it’s wrong to do! How many times have you received email from students asking you to not drop them for failing, because they will loose their financial aid? This is a teachable moment! Let them know they are committing fraud. Obviously, they don’t know! Are we having conversations with students about how important integrity is to us and why it should be to them? Let’s work on that. I think it is critically important that the teacher have that conversation with the student about not only defining what the problem is, but also having a conversation that lets students know why it should be important to them and IS important to us that they be original in their work and their lives. The consequences of degrees that don't matter are huge for all of us, but the consequences for the student of being unprepared for life and work, is much more important to address. Visit the wonderful blog post by Michelle Warn at WCET for some good information about strategies to cope with the problems of integrity in online environments. These are the thoughts I had while flying home after the MOOC Research Initiative Conference, held in a very icy Texas. As an aside to my general thinking about the conference, I noticed that in the cab on the way to the airport and in the line waiting for the plane, people were laughing and talking. They were all sharing stories of being stranded and of being on "hold" for hours with airline agents, and stories about where they slept--or not. There was much less cell phone diving than I saw on the way out to Texas. Five days after arrival, what had I gained? 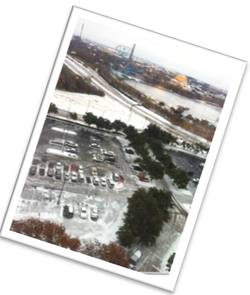 Certainly, the ice storm made me lose a day or two, although, the conversations among the stranded were as interesting, if not more interesting than the ones within the confines of the conference. The best conversations took place in the bar over wine and food! ---- “Social and community”, surprise, surprise. On Monday morning I received an article in my email, commenting on how Penn State discovered that the MOOC courses aren’t panning out the way they had hoped (of course it was blasted across the journal-ways.) My question was, “what was their hope?” I think that anyone who thinks that these courses will net them 40,000 new students right out of the gate, who are tuition-paying-credit receiving folks, may have elevated the power of hope to a new level. Throughout the conference, the question of who MOOC students are kept popping up in the context of success and completion. Everyone wants to know who the students are and what they are doing. We, at MSJC, also wanted to know what the students were doing and why. Really, when we think about it, we know who they are. They have told us in the myriad of survey’s we’ve run and in the discussion forums and in the ad-hoc Facebook groups. They are curious, interested, serious, casual, honest, dishonest, angry, loving, helpful, lost, funny, old, young, men, women, teachers and students and we should be listening closely to all of them. Each one had a reason to enroll in the MOOC they chose. Many enrollees had educational reasons to participate, some of them, however, just wanted to watch. The traditionally defined successes seem small in comparison to the numbers who enroll. Of course, we ask ourselves, “How long would it take us to teach 3,000 students successfully in regular online or face-to-face courses?” That idea helped us put some of it in perspective, but in our beginning writing course, I mostly saw people who wanted to be part of a community. In our course it was a community of writers, and/or a community of conversation, and/or a community of learning. They were social and they were curious. As teachers we were reminded, in a gigantic way, of why we got into this profession. These classes are an opportunity to bring people together around information sharing. Why would we trash-talk the vehicle? With all of us retreating more and more into our headphones and mini-screens, isn’t it time to be using the digital potential for building global community around education? I honestly don’t care about how many of anything we have in these courses, I care that the ones who know what they enrolled for, receive it! I care that the others find something interesting and expand their thinking at all. I am tired of making the numbers matter. I understand that there’s a great deal to learn from the research and it’s amazing that we have such a terrific opportunity to do that. I guess my concern, now, is that we will focus in the wrong direction and see MOOCs not worth the trouble. I’m not a “Pollyanna”. I understand that everything costs money, so won’t the 3000 who earn certificates justify the cost? If not, then we need to share our content and expertise more, not less. We’ve been suspicious of the .org’s turning into .com’s and likely should be asking some questions about that, but then let’s look at all of it for what benefit it has on a global scale. So many times, I’ve see innovative ideas in education get dragged through the mud and then abandoned before we really had time to explore their potential much past the hype. Maybe when we get the discussion forum coding figured out we will be able to report the research around connection and community. I hope that happens before the platforms go the way of the Dodo.... uh.... Udacity-bird. Wondering How to Design a Hybrid Class? If you are thinking about teaching online and want to start with a hybrid, or partially online, course, then this document may be for you! 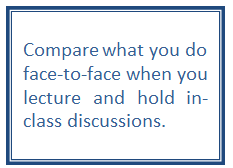 I have had many colleagues ask me the question, "How much of my course should be online and how much should be face-to-face?" Below is a working document that I have used in a face-to-face workshop about designing hybrids. You can download a .pdf of the worksheet at the bottom of the page. There is also a download link to a guidelines document that is additional information. Re-posted from the WCET Frontiers Blog click on the map below to visit the post at WCET. We encourage you to view a Youtube video of a sample lecture or view our “Good-Bye” video. Where are we going with this MOOC stuff? This is not a question I ask lightly. There has been a huge buzz about MOOCs and how they will be either the savior or downfall of education and/or civilization! I’ve been here before. The first connectivity in the early days of the Internet made many of my colleagues think the end of the teaching world surely had arrived. I remember hearing them say that they would no longer have jobs! Most of them, if they haven’t retired, still have teaching jobs. Ahem–what are we hearing now? The same cries. For many teachers the MOOC methodology is frightening. For me, it’s exciting! Each time we step out and try something new, we become more alive. Each time we reinvent the way we teach, we become more aware of learning. I welcome the new ideas and grab the opportunities to experiment and grow. This philosophy is responsible for my journey into MOOClandia. This one starts in the Spring of 2012 when I was asked to participate in a meeting of state level officials the purpose of which was to consider how online course delivery, including MOOCs, could provide greater access to California students. The conversation was about how to offer courses more broadly across the educational sectors of the state and particularly how the California Community Colleges could use their over ten years of distance education expertise to make something happen. We were experiencing a state-wide economic crisis that left students waiting at the registration door without enough classes to go around. Cuts were being made at every college. At ours, the entry level courses that meet the needs of students needing to remediate into college level courses were cut in favor of the transfer level courses. Our big concern was what do people who don’t assess into college level classes do now? I sat down with two of our English faculty members and we decided to try to put together an open course designed to help students assess into freshman composition or at least, into the next level down instead of three levels below the transfer level comp course! I was put in touch with Daphne Koller at Coursera through the people at our state chancellor’s office and had a series of conversations with her about “educating the world” and serving students such as ours in the process. She agreed to have Coursera host our course, if we could build it. We started planning. Within weeks, there was a request for proposals from the Bill & Melinda Gates Foundation that addressed just what we were trying to do, build entry level classes. We applied and were funded for $50,000 to develop and implement a basic writing MOOC in partnership with Coursera. I immediately began to research the style of courses in Coursera and realized that our expertise in creating quality “traditional” online classes would really help in this new effort. Course design was primary in my mind as a direct route to building a quality class. The classes in Coursera were as diverse in their design as in their topic areas. I saw everything from the “only video lecture” courses to incredibly detailed interface designs that would be daunting to a beginning online student. Our design experience was well suited to the beginning level student we imagined would enroll in our grammar and language usage course. The team was assembled and included our own video production faculty (2), English faculty (4), instructional designers (2 part time faculty with expertise), and me. I realized about a month in that I needed a project manager who could get things done and one of our designers became the PM. I switched to design support! The development went slowly, too slowly! Lots of time was spent on the video production of the lectures and the written content. We weren’t done with the whole course when it opened! That’s hard to manage and not what I would recommend. We trained seven of our writing center tutors to help us monitor the discussion forums when the course opened and all of the rest of us were involved there, too. There were a total of 14 staff members involved in answering discussion post questions. Students in the course came from throughout the world. Holy cow!!!! We watched in amazement as our Google map grew to show that our students were coming from every corner of the world. For almost a month, enrollment grew by 1,000 people per day! We wondered who these students were and about 10,000 took a survey in the beginning with the results shown on the right. We also found out that over 65% were English as a Second Language (ESL) students. We thought we’d have some, but the number was a bit startling. We ended up with over 40,000 enrollees with about 30,000 active users of the course. More than 3,500 completed the final peer review assignment (required to pass) and about 2,700 actually received a certificate of accomplishment. The data that was available from Coursera was difficult to format and we are still trying to correlate students to answers from both the entry and exit surveys. We have asked Coursera to consider the problems we have had and said we are more than willing to work with them to develop solutions. The good stuff that has come of this would take days to write about. We received compliments from students for about every aspect of our course. The design was easy to follow and many appreciated our first unit on being a successful online student. The big favorite, and tone setter, was the quality of the video lectures in the course. Both the production and content were great, but it was the interaction and personalities of the two professors, Ted Blake and Larry Barkley that made the class so wonderful. We had them talking together in the video lectures and it really was a good format for delivery. Students loved both guys and commented often about their humanness. Another big compliment from students was that we were so responsive. With 14 people able to participate in the discussions, students felt tended to. We stand by our decision to be as present as possible in the discussion forums. Our reading material was an excellent supplement to the video lectures and the discussions were interesting and prolific. When one student from Jordan said, “Before this kind of opportunity, education for me was just a dream,” we were hooked. Another young girl in a discussion of ages of the students noted that, “Knowledge has no age.” My favorite comment was that we had infected the class with a virus and that now everyone had the “grammar flu”. I understood exactly what she meant as I struggled to correct every bit of my writing in the responses I provided in the forums! We received 180 thank you letters posted in an album style cloud website that was organized by another student. We just received an envelope filled with souvenirs from Australia from a student in appreciation for our team. You have to be thick-skinned. The three students who like to complain about everything in a small class, are magnified by thousands in a huge class. Let the other students shut down the complainers. You don’t have to do anything! It is good to have online teaching experience before you start this kind of course, but designing one of these is different in many ways. What’s the same? Organization is EVERYTHING. Many of the professors from major institutions who are now teaching in MOOCs, have little or no prior online teaching experience. We think the MOOCs, with their huge public relations potential, appeal to the university administration, but the joyful and exciting experience of teaching thousands of students from all over the world grabs the imagination of the teachers. Grading is impossible so you have to rely on machine grading and you have to have detailed rubrics developed for the peer reviewed assignments. The Coursera platform randomizes and creates the groups, the highest and lowest scores are dropped out of the final grade. Even if a course is not for credit, students are crazy about points. Being available and human is a must. Be prepared for a life changing experience. During a presentation to teachers, I was asked, “Isn’t this just passing on information rather than educating people?” My answer was that we absolutely educated people. There is no doubt in my mind that the course we offered was education, complete with interaction, innovation, inspiration, and, yes, information, too. What do you think we should be doing now? Should we investigate or castigate? Consider MOOCs in light of all of the other technology innovation we have experienced in the past 15 years. How is it different? How is it similar to other changes? Where are we going? NOTE: This post pertains to traditional online courses in institutions of higher learning. Constructivist approaches have a different focus and timing would be addressed in a completely different way. Because time is a different animal in Distance Education, you may have the idea that making your course self-paced, in other words opening all your learning units at once, is a cool idea. It has major drawbacks for traditional educational approaches. This document is offered as a brief guide to managing your content. It’s a given that you have all kinds of students in your classes, some will get the material quickly and be ready and eager for more, however, others will struggle to get through all of your material in a given unit of time. Finding a balance for all students is a little tricky. Consider what you want them to do together as you are trying to decide what release options you will employ in your course design. Generally, teachers want students to discuss content that is presented at the time it is presented. If you have a learning unit in progress that includes a discussion or requires comments in a blog, for example, it’s useful for all the students to be focused on that particular unit at the same time. Even though the idea of what you are doing results in asynchronous activity, too much lag time in posting replies in forums, causes an end to active participation! How does this work in a face-to-face class? Students may have all of the reading and assignment scheduled in a syllabus that they can refer to. They can read ahead all they want, but the actual directions for the activities aren’t part of the syllabus because you want to have the students ready to do those activities and you are the one who prepares them! You also wouldn’t want them to come in three weeks after the fact and try to ask questions during your lecture about things that you have already covered! The converse is also true. It’s tough and distracting to have students asking questions in class, that are too early in the general progress of the group, to address. How often have you found yourself saying, “That’s a good question and I’ll get to that”, knowing that the context of presenting information is important. These things are the same in an online class. Timing adds to the ability for you to provide context and students that are too far ahead, may miss that and head out in the wrong direction or not participate as you would like them to. So, what’s the solution? It depends--- A good rule of thumb would be to open a unit and then a few days before the end of it, open the next one. Keep the interactive components, like discussion questions, closed until the actual opening date of the class. You may want to adjust that as you get the feel for the ability of the students to work on their own. For sure, you want to keep them focused at the same time on the interactions they will be involved in. Keeping control of the release dates also makes it easier for you to work in the class. You can plan for each week’s worth of work and are grading and offering comment on the same topic all week, rather than jumping around. This also gives you perspective across the work that is being submitted, which is a really good thing. Reminder: Distance Education courses are defined in the "Higher Education Opportunity Act" (Federal) as having interaction between the instructor and the student. Correspondence Education is defined as “self-paced” and limited interaction with the instructor. Distance Education funding is different than correspondence funding in many situations. Students cannot receive federal financial aid for correspondence courses. Educational institutions are liable for any financial aid money that was given to students in correspondence courses. Additionally, correspondence courses are not considered as transferable courses by many universities. Developing Late Policies: Developing Late Policies: This blog post is about developing late policies for traditional online courses and how those policies should relate to your own philosophy about teaching. 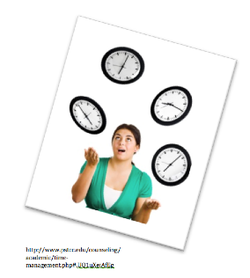 Have you ever thought about not penalizing students for late work? In my classes, I generally provide due dates, however, there are no late penalties. The reason I do that is that this course is about learning to do something in a format that students may be completely unfamiliar in, number one. Secondly, my goal as a teacher is to make sure my students learn what I have to teach them and that they do quality work as they learn. As a multimedia teacher, I knew that the blending of art and technology is difficult for many students. Usually, they came to my class with either technology skills or art background. Some, of course, came with neither, but that was a relatively small number. Because the class was usually evenly split, when we did technology-related assignments, one part of the class needed more time and vice versa with the art people. It didn't take very long to figure out that providing a window of time for the due dates for things, worked out well. The other issue was wanting students to do their best quality work. If after the window closed, a student wanted to re-submit their work, I let them better their grade. Not many students took me up on that. Usually, it was the students who were going to become professionals in multimedia design who resubmitted. I think, though, it made them less stressed about doing the course work and I received beautiful work! Ultimately, I want the students to tackle and learn the material. I believe that when students are confronted with difficulty in completing work, there could be a variety of problems going on. These "problems" often are issues that have come up for the student before and may be something they will continue to confront if they are not discovered and remediated. An online environment is often a great place for learning about learning to take place. A good example might be referring to a student having time management issues to an optional calendar development assignment. I find myself working with students all the time over issues of their poor time management skills and/or their lack of resources. I ask students at the beginning of the course to let me know, in advance if possible, when they are having problems with due dates. By doing that, I usually find out what challenges many of my students face and contact over late work may be an opportunity for me to offer resources. Because time is flexible in an online class, you can play with how you deal with late work and other issues students have that set them back. Please take five minutes to read the blog post at the link above and then feel free to comment with your questions, ideas, and experience.